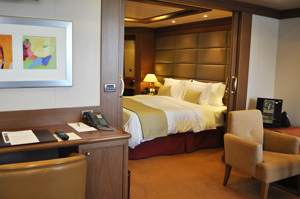 Which cabin should I choose on Silver Spirit? Best For: Value seekers content with using public outdoor space. What You Get: Though this is the starting category, vista suites are a whopping 312 square feet. They’re located on Deck 4 — the lowest level holding passengers. Best For: Passengers who enjoy comfort but don’t need extravagance. What You Get: Otherwise identical to the vista suites, these offer a private balcony. Here, sliding glass doors open onto a teak deck, where your butler can serve afternoon tea or a whole meal, course by course. Prices within the category vary according to location (the higher the deck, the more expensive). Some cabins accommodate a third passenger on a convertible sofa. Best For: Those who want more space and a quiet upper deck. What You Get: At 742 square feet, silver suites are almost twice the size of veranda suites. (They’re also double the price.) Upgrades include a Bang & Olufsen® sound system, twin sinks, and afternoon canapes. 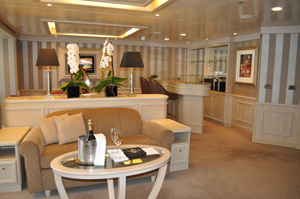 These suites are located on the ship’s top decks, which means better views as you pull into port. 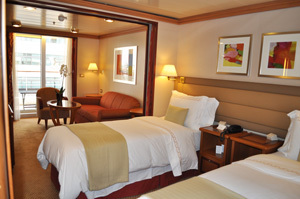 Bonus: Those on Deck 11 have easy access to the hidden-away Observation Lounge. 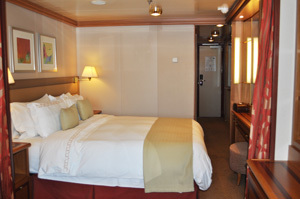 Best For: Cruisers who want more space or need a second bedroom. What You Get: In these 990-square-foot suites, a wedge-shaped living room is lined with a wet bar with glassware on one end, and a desk on the other. There’s also a dining room table and a powder room. A queen bed sleeps two people, a sofa bed holds a third passenger, and you can connect this suite to the adjacent one for a two-bedroom configuration. Additional amenities include a whirlpool tub and an Illy® coffee maker. Best For: Those who want the best seats in the house. What You Get: Grand suites are similar in configuration to royal suites, but with one dramatic difference: the 560-square-foot wraparound balcony — hands down the best feature of these cabins. 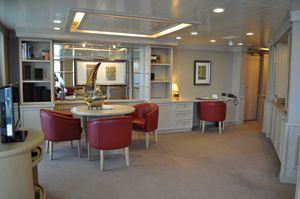 With an impressive 1,425 square feet (both indoor and outdoor areas combined), these are the most spacious of Silver Spirit staterooms. Best For: Passengers who want the very best, and those who like to entertain in the privacy of their own suite. 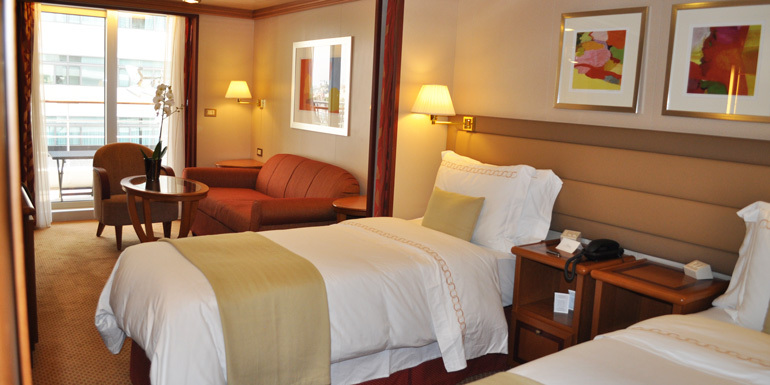 What You Get: At 1,292 square feet, these suites — there are just two of them on Deck 8 — are designed for celebrations: There’s a bar with stools, a sizeable living room with two couches, and a dining room table with six chairs. The bathrooms are equally extravagant. Even the walls are marble, and there’s a separate toilet and bidet. The balcony is ample size, though nowhere near that of the grand suites. 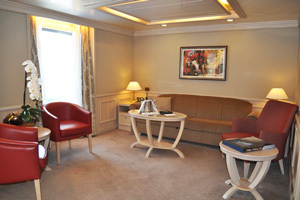 As in royal and grand suites, you can book the adjoining room to accommodate another two people. A number of amenities make Silversea suites the standard-bearer of luxury at sea: Butlers service all staterooms; beds are dual-side mattresses that can be reversed to reveal a soft or a firm side and are dressed with Pratesi sheets; a refrigerator is stocked with beverages; and you’ll find personalized stationery, binoculars, robe and slippers, and (on your pillow) Pierre Marcolini chocolates. There are also iPod® docking stations, two TVs, and spacious walk-in closets with safes. Bathrooms have full-size tubs and separate showers, fragrance diffusers from Italian perfumer Laura Tonatto, and a choice of Salvatore Ferragamo®, Bvlgari®, or hypoallergenic bath amenities. In addition, royal, grand, and owner’s suite guests have unlimited dry cleaning and pressing service, four hours of free Internet, two hours of international calls, dinner for two at Le Champagne, and daily newspaper delivery. Bang & Olufsen is a registered trademark of Bang & Olufsen. Illy is a registered trademark of Illycaffe S.P.A.
Salvatore Ferragamo is a registered trademark of Salvatore Ferragamo S.P.A.
Bvlgari is a registered trademark of Bulgari S.P.A.
What do you like best about Silversea cabins?